Accurate Label Designs has recently partnered with STOPware, Inc.
STOPware, Inc., a Brady Worldwide corporation, is a software company specializing in visitor management security software. 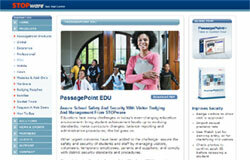 Since 1997, STOPware has pioneered the lobby security software marketplace. With the addition of an Automated Visitor Management Software product, Accurate Label Designs is continuing to work toward its goal of satisfying the Visitor Management needs of schools nationwide. Please call us at 800.222.4712 with any inquiries as we continue to launch this new partnership later this year. © Copyright 2019, Accurate Label Designs. All rights reserved.